Motolské cvičiště is mentioned by the narrator as he informs that the Motol military training ground is used for executions of people who are sentenced by Vojenský soud. We must also assumed that the plot took place here in [I.11] and [I.12]: the field masses described very probably took place here, that Katz and Švejk went to nearby Břevnovský klášter to pick up the monstrance and siborium underpins this theory. 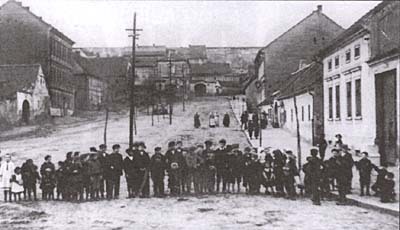 Motolské cvičiště was an exercise ground in Motol, a district in western Prague that became part of the capital in 1922. 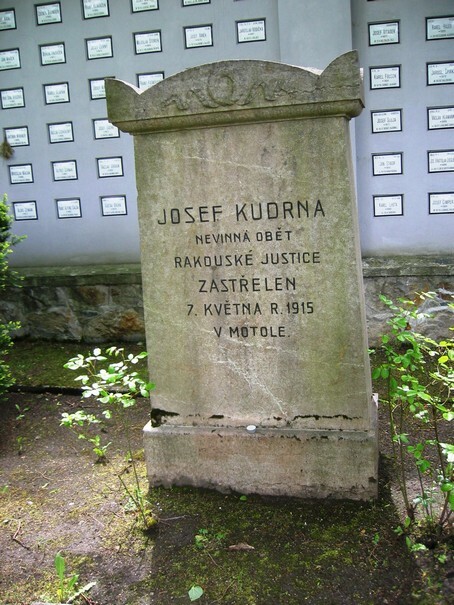 During WW1 several executions took place here, the most infamous of these being that of Kudrna on 7 May 1915. This incident is mentioned in the novel during the train journey from Budějovice to Bruck an der Leitha. During the first field mass the author also mentions a plum-tree alley. In adverts in Prager Tagblatt Korpskommando tries to lease out fruit from the trees at the exercise ground. It is not stated directly, but they are very probably dealing with plums! [1.9] [I,9] Z hradčanského garnisonu vedla také cesta přes Břevnov na motolské cvičiště. Napřed šel v průvodu bodáků člověk s řetízky na rukách a za ním vůz s rakví. A na motolském cvičišti úsečný povel: „An! Feuer!“ A po všech regimentech a batalionech četli plukovní rozkaz, že zas jednoho zastřelili pro vzpouru, když narukoval a pan hejtman sekl šavlí jeho ženu, která se nemohla od muže rozloučit. [1.9] [I,11] Vypadalo to jako indiánský tanec kolem obětního kamene, ale dělalo to dobrý dojem, zaplašujíc nudu zaprášeného, smutného cvičiště s alejí stromů švestkových vzadu a latrinami, jejichž vůně zastupovala mystickou vůni kadidla gotických chrámů. Břevnov is mentioned by the narrator as he informs the road from the Hradčany garrison to the Motol military training ground goes across Břevnov. It reappears in [I.11] when Katz and Švejk pass by the monastery to fetch the required gear for the field mass. Břevnov is a district in western Prague, between Střešovice and Motol. Administratively it is part of Prague 6. It is best known for its monastery. See Břevnovský klášter. In 1907 Břevnov obtained city status and that year even His Imperial Highness Franz Joseph I visited! The city was part of hejtmanství and okres Smíchov. In 1913 it counted 11,116 souls, and those were almost exclusively of Czech nationality. [1.9] Z hradčanského garnisonu vedla také cesta přes Břevnov na motolské cvičiště. Napřed šel v průvodu bodáků člověk s řetízky na rukách a za ním vůz s rakví. North America is mentioned because Katz' father had emigrated there to avoid the consequences of his son's spectacular bankrupcy. North America denotes a geographical area, the American continent north of the Panama Canal. There are many definitions but the simplest one describes the area north of the Panama Canal and includes the Carribean Islands. The largest states are the United States, Canada and Mexico. The former two both took part in WW1, Cananda already from 1914 as part of the British Empire. [1.9] Studoval obchodní akademii a sloužil jako jednoroční dobrovolník. A vyznal se tak dobře v směnečném právu a ve směnkách, že přivedl za ten rok obchodní firmu Katz a spol. k bankrotu tak slavnému a podařenému, že starý pan Katz odjel do Severní Ameriky, zkombinovav nějaké vyrovnání se svými věřiteli bez vědomí posledních i svého společníka, který odjel do Argentiny. Argentina is mentioned by the author when he relates the story of Katz's firm. His companion decided to emigrate to Argentina after their company's spectacular bankrupcy. Argentina was until 1916 governed by a conservative elite, and was at the time a relatively wealthy republic. General male suffrage was introduced in 1912. The country was neutral in the world war and benefited greatly economically. A dispute with Germany occured because some Argentian ships were sunk, but it never came to any formal declaration of war. The country's capital is Buenos Aires and the official language is Spanish. The population is almost entirely of European descent, predominantly through immigration from Spain and Italy. South America as he relates the story of how the compnay Katz & Co now had moved to Amerika, north as well of south. South America is the southernmost of the two continents that make up Amerika. In 1914 it consisted of the same countries as today, it was only in Gyuana thta colonies remained. The other countries except Brasil (and the three mentioned colonies) had Spanish as official language. During WW1 all the states except Brasil preserved their neutrality. They entered the war on the side of the Entente in 1917 and sent auxiliary personell to the western front and the navy took over patroling duties in the south Atlantic. Fighting around the continent only took place at sea and were limited to 1914 when British and German naval forces clashed. The German Pacific Fleet (on their way home) was destroyed by the Falkland Islands on December 8 1914. [1.9] Když tedy mladý Otto Katz podělil firmou Katz a spol. nezištně Ameriku Severní i Jižní, octl se v situaci člověka, který nemá vůbec co dědit, neví, kam hlavu složit, a musí se dát na vojně aktivovat. Slovakia is mentioned in the narrative as a gypsy was accused by lawyer Bernis for having spoken in the pub about a future Czech-Slovak state under a common Slavic king. The gypsy was actually arrested for theft, but Bernis always mixed up the documents of the criminal proceedings. Later some of the action in C (III, 4) takes place in eastern Slovakia, mainly in Humenné and Medzilaborce. Otherwise many places in the country are mentioned through anecdotes and stories from the winter battle in the Carpathians in 1914-15. Slovakia was in 1914 part of Austria-Hungary and was governed from Budapest. It was also referred to as Upper Hungary. From "Ausgleich" in 1867 onwards Slovakia was subjected to increased magyarization, with oppression and discrimination, economically as well as culturally. Schools were closed and the Slovak language suppressed. During this period international names like Bjørnson, Seton-Watson and Tolstoy came to the aid of the Slovak cause. The biggest city was Pozsony (ge. Pressburg), after the war renamed Bratislava. From November 1914 to the spring of 1915 Russian forces occupied a smaller part of Slovak territory, but were finally pushed out in early May 1915. In 1918, Slovakia together with Bohemia, Moravia, Ruthenia and a small part of Silesia formed the new state of Czechoslovakia. Jaroslav Hašek knew Slovakia very well due to four extensive trips he did in the summers from 1900 to 1903. He wrote several stories that were inspired by these trips. In 1915 he again entered Slovakia, but now as a soldier. His march battalion actually stopped in Humenné on 2 July 1915. They travelled through the Laborec valley with train and this short through-trip is reproduced precisely in the novel (in a geographical sense at least). [1.9] Jeho prozíravost a znalost lidí byla tak veliká, že jednoho cikána, který se dostal od svého pluku na garnison pro krádež několika tuctů prádla (byl k ruce skladníkovi ve skladišti! ), obvinil z politických zločinů, že prý někde v hospodě mluvil s vojáky o zřízení samostatného národního státu ze zemí koruny české a Slovenska se slovanským králem v čele. Libeň is mentioned Švejk when he is interrogated by Bernis. In an anecdote he emphasizes that he, just as the kid who was found in Libeň is an orphan and doesn't know why he is found and arrested. Libeň is mentioned in a few more anecdotes but the plot is never set there. See also U Exnerů, Boušek and Na Zavadilce. Libeň is an urban district and cadastral area in the north-eastern parts of Prague. It was granted town rights in 1898 but was included in Prague only three years later and administratively it became Praha VIII. In 1913 the population number was 27,192 of which all but 420 were registered with Czech nationality. [1.9] „Poslušně hlásím, že to mohu vysvětlit náramně jednoduchým způsobem. U nás v ulici je uhlíř a ten měl úplně nevinnýho dvouletýho chlapečka a ten se jednou dostal pěšky z Vinohrad až do Libně, kde ho strážník našel sedět na chodníku. [I.13] „Poslušně hlásím, pane feldkurát,“ poznamenal Švejk, „že je to hotovej nezmar, jako nějakej Boušek z Libně. Vosumnáctkrát za večer ho vyhodili od ,Exnerů’, a vždycky se jim tam vrátil, že tam zapomněl fajfku.